'Heat Flare' ( Les Peterson, R. 1972). Seedling #LP 71-11. BB, 27" (69 cm). Midseason to late bloom. Deep oxblood red (Ridgway 00823); self stylearms; deep yellow beard. 'Caliente' X seedling #LP 69-69: ( 'Barbizon' x 'Fire Ruby'). Peterson 1973. Honorable Mention 1976. From AIS Bulletin #209 April 1973 Introducing HEAT FLARE. ((Caliente X «Barbizon x Fire Ruby) x ((Main Event x Captain Gallant) x (Crescendo x Tantallon)). BB, 27", ML. 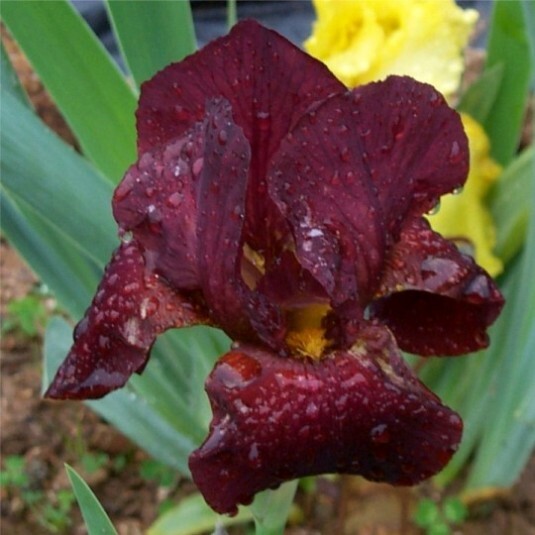 This Border Bearded of deepest oxblood red (Ridgway 00823) has a richness and glow equaling that of its Tall Bearded counterpart ARDENT GLOW. Standards are full and erect; falls are round and flare horizontally. Sure to please, $20.00, Les Peterson.